In the Menni Brain Damage Network, we bring together technical competences and human values to rehabilitate, accompany, and deliver care to brain injury patients. Our nuns’ long-standing values -compassion, friendliness, commitment, and dedication- are brought to this service network catering for both patients and their families, combining the tradition of patient care with innovative service. Our centres result from the combination of our tradition in patient service and a drive for innovative care. Based on individual evaluations of patients, our multidisciplinary team designs therapy plans involving such aspects as mobility, independence in activities of daily living, communication, emotional and cognitive functions. The main goal is that patients recover as much independence as possible, and we are committed to promoting the highest level of human dignity. Aita Menni Hospital is a non-profit organisation specialised in the treatment and care of people with mental health problems, dementia, or brain damage. Established in 1898, today Aita Menni Hospital has hospitals, day centres, rehabilitation and day care centres throughout the Basque Country. The Brain Damage Service at the Aita Menni Hospital, established in 1992, was the first of its kind in Spain. It has an Inpatient Care Unit with 20 beds in Mondragón, and outpatient rehabilitation units in Bilbao, San Sebastián and Mondragón. Also, it has a Children’s Rehabilitation Unit in Bilbao and two Day Care Centres in Donostia-San Sebastián and Mondragón. The Beata María Ana Hospital in Madrid was founded in 1888 with the aim of providing a home and education to orphan girls. Nowadays, it is a medical and surgical centre that offers a wide array of medical specialties and modern central services such as inpatient care unit, emergency service, surgical unit, ICU, image diagnostic service (CAT and MR), and a full range of physical and neurological rehabilitation services; in particular, the Brain Damage Service, featuring an inpatient care centre with 19 beds, an outpatient rehabilitation unit and a children’s rehabilitation service. The Benito Menni Hospital Centre in Valladolid has been operating since 1972. 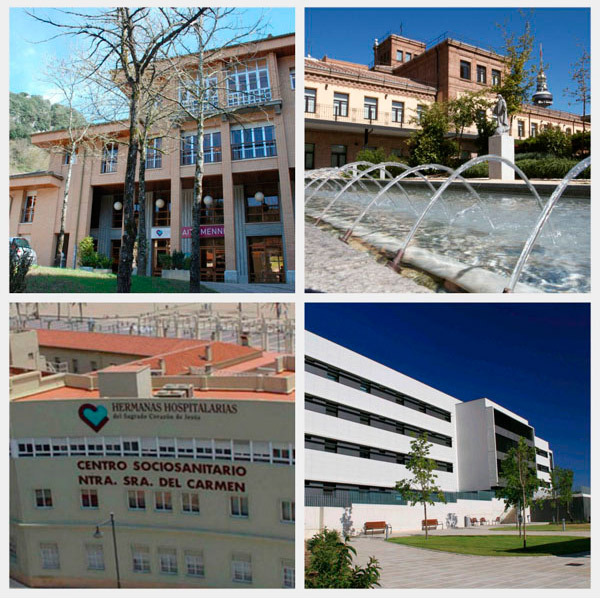 Its Integrated Care Model has received several awards, such as the IMSERSO awards in 1999 and 2000, on the hospital’s 25th anniversary, and the San Francisco Clinic Award 2003 to the Best Social and Healthcare Centre in Castile-León. It was also the recipient of the Sanitaria-2000 Award for Best Healthcare Centre in Castile-León in 2009, among other prizes. These recognitions have encouraged the Centre to keep working towards quality healthcare. The Brain Injury Unit at the Benito Menni Hospital in Valladolid has an outpatient rehabilitation unit and a children’s rehabilitation unit as well. It provides medical and nursing inpatient care to patients undergoing rehabilitation. The Nuestra Señora del Carmen Home and Hospital was established in Valencia in 1919 with the aim to host and provide medical assistance to ill girls. With time, the surgical hospital turned into a home and day care centre for the elderly, while keeping its outpatient rehabilitation service. To meet the most urgent needs, a Brain Injury Unit was set up in 2002. Today, the Brain Injury Service at the Nuestra Señora del Carmen Healthcare Centre features an outpatient rehabilitation unit and a children’s rehabilitation unit too.